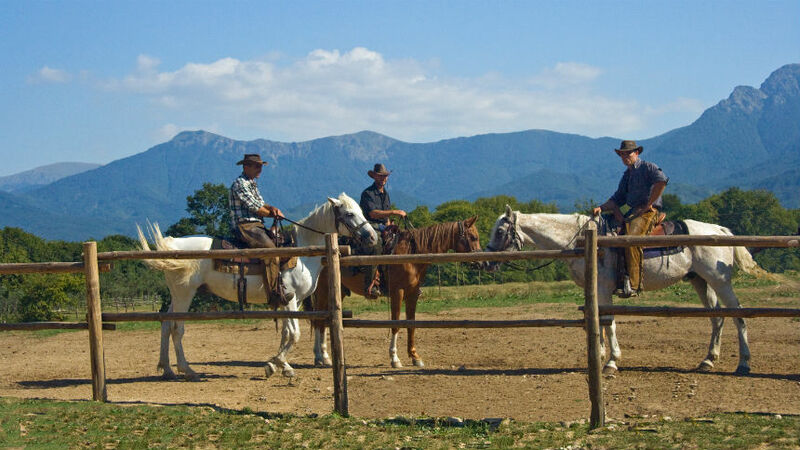 Horseback Riding In Bulgaria. 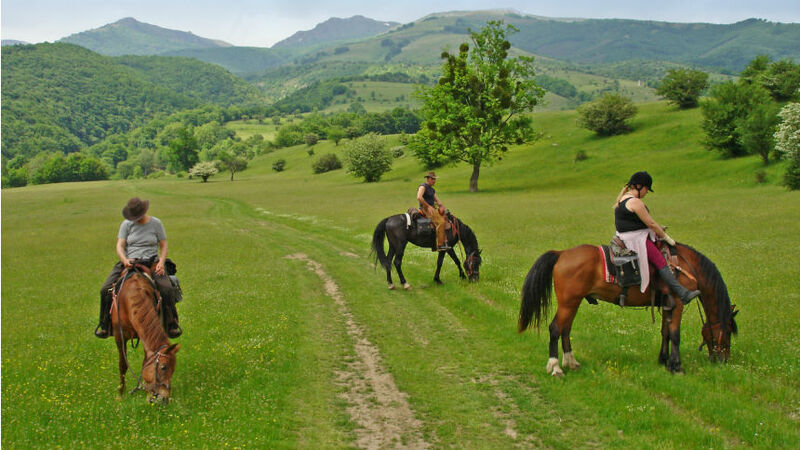 Balkan Rides - Equestrian Holiday For Beginners And Advanced In The Balkan Mountains, Bulgaria. 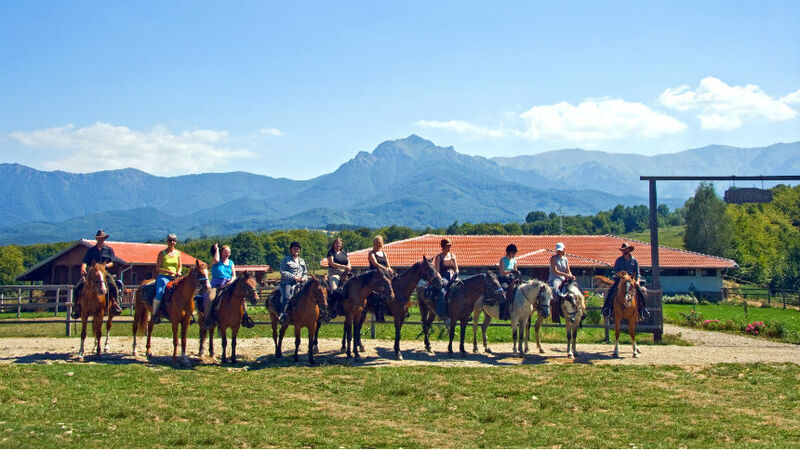 The riding base, where this holiday takes place, is situated on the northern side of the Balkan Mountains in the vicinity of the charming town of Apriltsi, facing the most fantastic panorama towards the range of the highest peak in the mountains – Mt. Botev (2376m a.s.l. ), and Central Balkan National Park. Nowadays Apriltsi is a town, which has assembled 4 villages in the past. Many painters, musicians and writers have found the freedom to be creative in these surroundings and their houses are real workshops. But what fascinates most is the background of tempting mountains, promising unforgettable experiences and challenges, which you will be able to explore along with your riding guide. This tour provides countless opportunities for all riders – from complete beginners to advanced riders. The program can be adjusted on spot depending on your level of experience: you can either trace the hidden trails in the woods or the green slopes of the mountains helped by our guides or make your first steps in the horseback riding. For the experienced rider there are many possibilities for challenging riding in the mountainous terrains. We ride through mountain rivers, up and down steep mountains and all other kinds of areas. And the terrain is for all types of riders. Our riding guides know what to show you if you’re experienced but also if you don’t have the experience yet. The biggest difference between the trails and a one base week is exactly here:a stay in the riding base is giving the experienced rider a lot of possibilities. 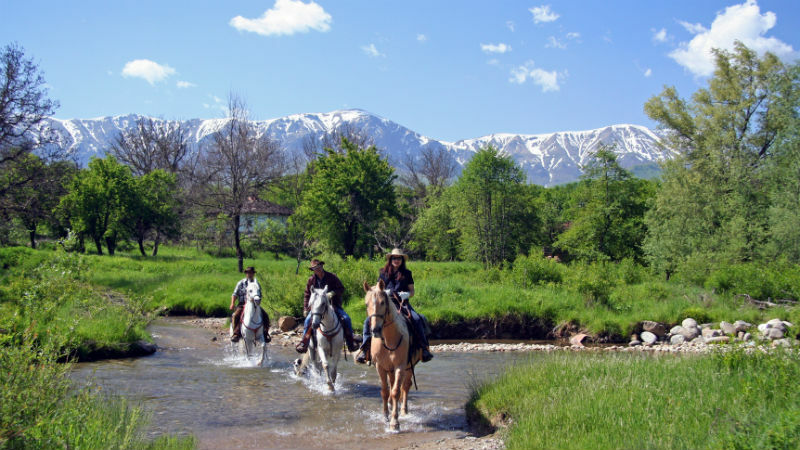 For the less experienced we ride for a while near the base and when you get comfortable with horses and the equipment we ride out in the mountains – and also in all paces if you are for that. Day 2. In the morning you will meet the horses for the first time. You will be briefed by the guides about the horses, the rules, the riding and sightseeing opportunities in the area. After lunch we will make a round tour on a horseback (3 hrs) to get an impression about the area of Apriltsi. Day 3. After breakfast we meet again the horses and leave the village towards the green meadows. Here we can ride in all paces including a real gallop for the experienced riders. Lunch will be done as a picnic by the river nearby. In a couple of hours more we eventually get back in the riding base. Day 4. Today we will ride up in the mountains above 1000m a.s.l., where we will have lunch. Day 5. The ride today will be over the hill top of Ostrets and Peperi – under the Black Peak (1500 m a.s.l.) to a small monastery. Lunch in the monastery garden and ride back to the riding base through lush meadows. Day 6. The Central Balkan National Park is the target for our ride today. We pass by the Vidima Waterfalls and explore the greenery and the nature of this particularly beautiful place. Day 7. Now that you know a lot about the areas around Apriltsi you will be able to decide along with the rest in the group whether to go for one more ride in the mountains or to investigate the low hilly terrains and the small villages scattered among them. Farewell dinner in the evening. Except for riding it could be rather interesting to visit some cultural and historical places in the neighboring regions (paid extra on spot). These are the town of Troyan and Troyan Monastery, the open-air ethnographical museum of Etura by the town of Gabrovo, Veliko Turnovo (the capital of the Second Bulgarian Kingdom), the architectural reserve Arbanasi etc. Additional adventure: Depending on the time of the year and the weather conditions an extended mountain ride with an overnight can be organised during the stay. Payment on spot. Accommodation: When you choose a week in the riding base you will stay in the same house every day and you will have the possibility to follow the typical daily life in a small town, where the goats are still walking along the streets and the chickens live in the backyard. We have several possibilities: in our basic tour is included private accommodation. Usually you will stay in a house together with the other riders in double rooms with WC/shower on the floor. The stay is with full board and all meals are enjoyed in the house or outside in the garden. During the daily rides a picnic is organized for lunch or you bring a lunch package. Another option is to stay in one of the small hotels (additional fee), some of them with swimming pool. We can arrange the accommodation exactly the way you want it. 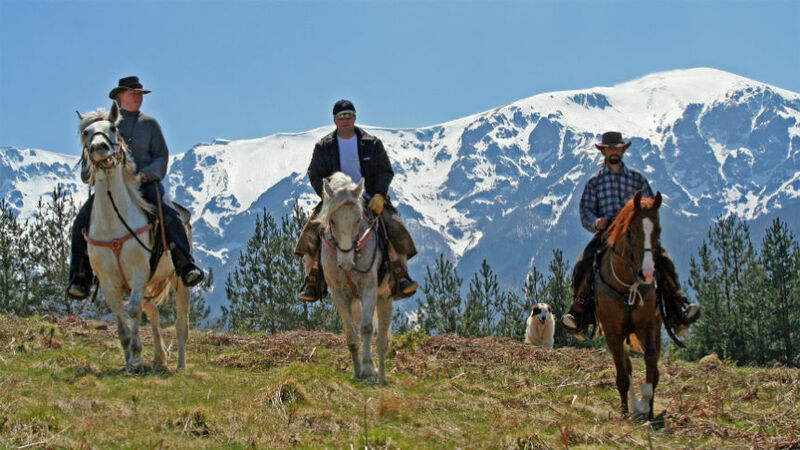 The price includes: transfers from/to Sofia or Plovdiv airport, 7 nights in Apriltsi based on private accommodation in 2-3-bedded en-suite rooms, full board, fully equipped “own horse” & riding guide (English-speaking) for 6 days.